As you may have seen- I use coconut oil in most, if not all of my recipes. I have previously written a blog post addressing the beneficial reasons of drinking coconut water, but I am now going to give some insight as to why I just love using coconut oil! Apart from the fact that it helps add delicious taste and texture to my recipes- it also adds nutritional value… Various human studies have confirmed that the combination of fatty acids that coconut oil possesses, have positive effects on our health. Although coconut oil is high in saturated fat, it is not the fat that you find in a block of cheese. The fat found in coconut oil is metabolised differently, meaning we can use these fats as sufficient sources of energy. These fatty acids are made up of medium-chain triglycerides (MCTs), which not only provide longer-lasting sources of energy but also help burn fat in the body. Coconut oil contains something called ‘lauric acid‘. Studies have revealed lauric acids helps fight bad bacteria that lead to viruses in the body. Studies have suggested that the good kinds of saturated fats that coconut oil possesses, can aid in raising the good cholesterol levels (HDL) whilst decreasing bad cholesterol (LDL) Over a long-term period, this can then lead to reduced risk of heart disease. Coconut oil contains ketone bodies, which supply energy for the brain. Researchers have suggested that ketone can provide a unique energy for source for any malfunctioning cells, and aid in reducing symptoms of Alzheimer’s disease. Lastly, aside from the amazing health benefits that coconut oil provides us with, it is also great for dry skin and damaged hair… So you can also use coconut oil to look beautiful on the outside as well as the inside of the body! I LOVE these things! 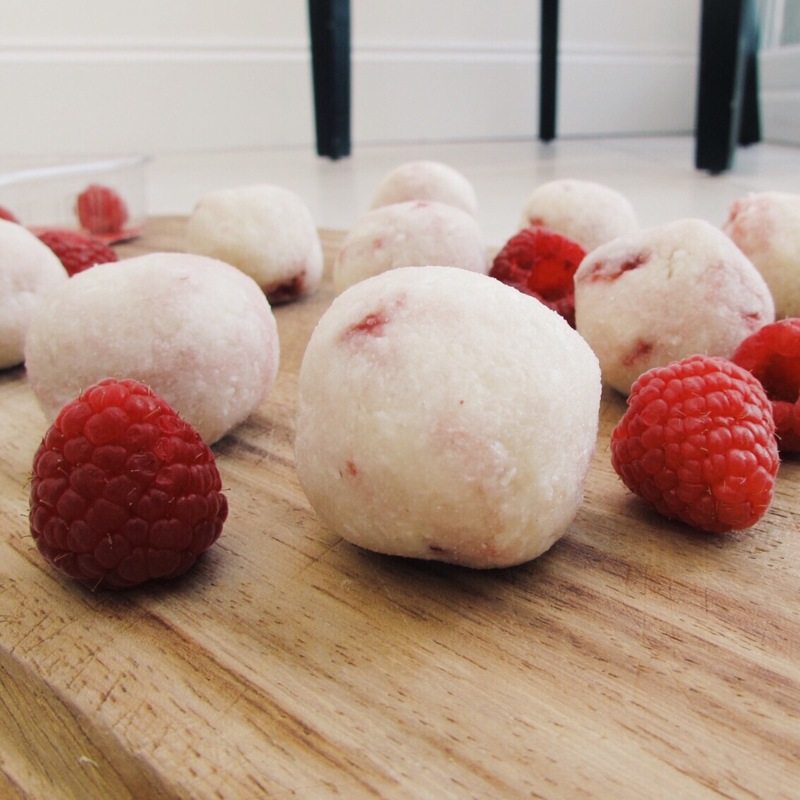 Raw balls are great for making in batches and keeping in the fridge for when you need a quick healthy snack or energy boost! I’ve been trying lots of different recipes- just throwing different flavours, spices and ingredients into a bowl, and this one I had to share.. The recipe I originally came up with gave just a subtle taste- so I decided to spice is up with some raspberry jam. Then I thought of something better. Instead of the jam (which, depending on which one you use can be quite high in sugar) I decided to add some mashed raspberries for a naturally sweet healthy taste! In a bowl, mix together the ground almonds, desiccated coconut and coconut milk. Add in the vanilla paste and coconut oil. 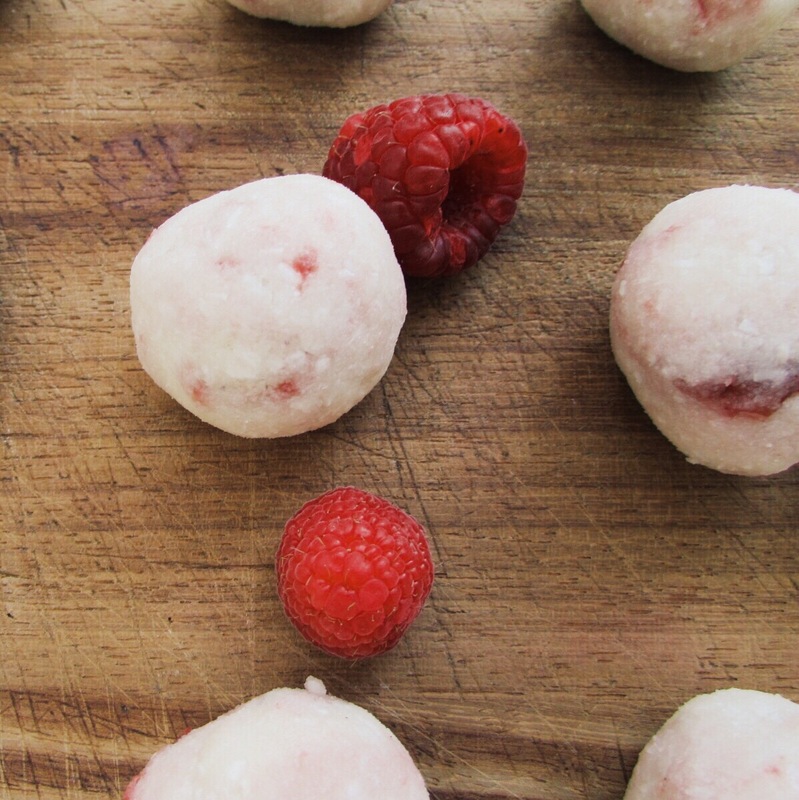 Add the mashed raspberries (or jam) until you reach a doughy paste-like consistency. 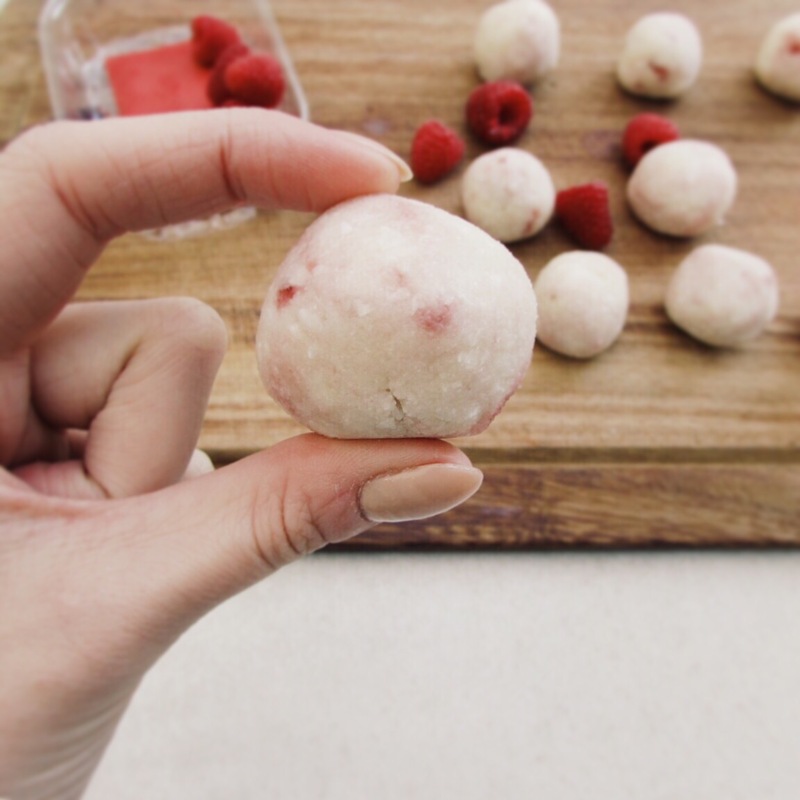 Roll the mixture into 12 evenly sized balls and place in the fridge on baking powder for an hour. 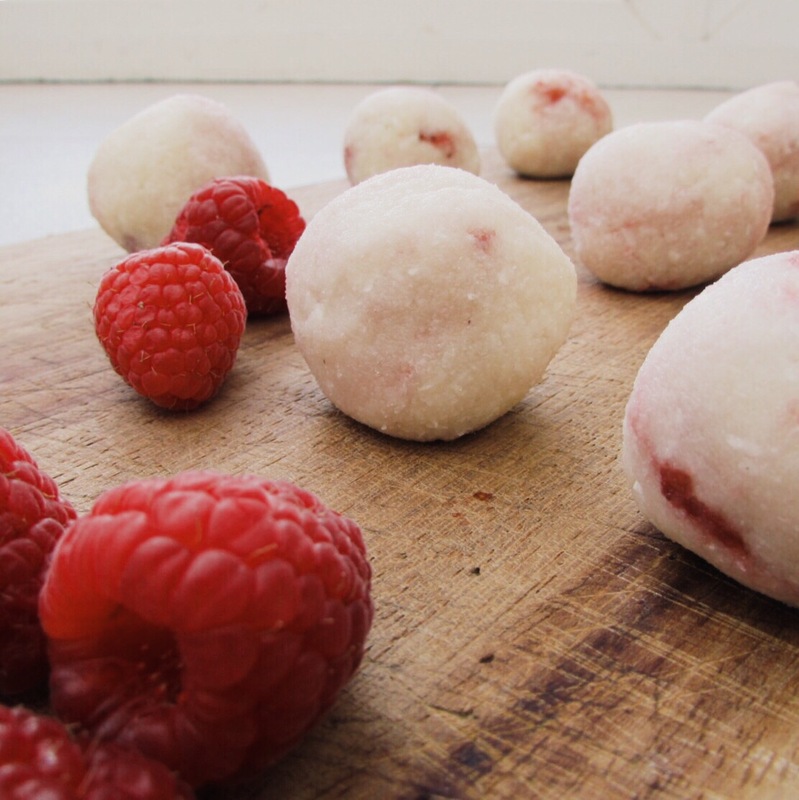 Enjoy these raw balls chilled! (They will last in the fridge for 4-5 days).